A pleasant little village, located just three miles (5 km) north of Oakham. The heart of the village is a small grid of lanes and streets, bordered by quaint thatched and stone tiled cottages. A small stream runs along the garden fronts in Water Lane. The old well, after which the village is named, is set in a copse of Ash trees at the edge of the village. 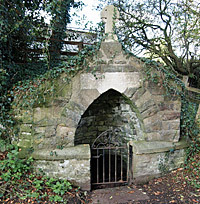 It is traditionally a Holy Well or Sacred Spring. All ye who hither come to drink. Rest not your thoughts below. Look at the sacred sign and think. Whence living waters flow. There are currently no pubs or shops in the village and the village hall and parish church are the main community meeting places. The 14th-c parish Church of St Mary was greatly restored in late 19th-c by William Butterfield. Butterfield also built the old school and alms houses (now 3 and 5 Cottesmore Road) and several estate workers cottages in Croft Lane and Woodside, in red brick with blue diaper patterns. The most important grave in the churchyard is that of of Rev J.W. Adams (died 1903), who was awarded the Victoria Cross for his bravery in the Anglo-Afghan War. An interesting 13th-c wooden figure of a crusader can be found within the church's south chapel. The main industry here is farming and agriculture. The surrounding land is gently undulating and used mainly for pasture, cereals and root crops. Old Ashwell Hall has manorial gardens and other earthworks to the north, which date back to the medieval period and are designated as a Scheduled Ancient Monument. New Ashwell Hall, a late 19th-c Tudor style building set in parkland, lies about 1/2 mile to the south of the village (not open to public).